Myths in the world of slot machines are abundant, and often so far off base you really have to question how they got started. On this page I'll list a number of common slot machine myths and discount their claims. Slot machines are more or less likely to pay off depending on their recent behavior. This myth often takes the form of 'don't play that machine, it just hit so it isn't due for a while'. But a slot machine doesn't base whether a spin is a winner or not on previous spins, it never bases a spin on a previous spin's outcome because it can't remember anything about a previous spin. Slot machines are programmed to go through a cycle of payoffs. Many people believe this, further spurring them to stick with their machine until it starts to hit for them. This is not true at all. Every trial is random and independent of all past trials. This is one of the most popular slot machine myths to ever get started, possibly because it used to be true, but not in modern times. Hot/cold coins are more likely to yield good returns. This one is just plain ridiculous. The temperature of the coin does not matter. Like I said, how do these slot machine myths get started? The lights in a machine can heat up the coins already deposited, but it won't affect the outcome. Timing of play can affect wins/losses. Some people try to measure the length of time between dropping in coins, as they believe it will affect the outcome of play. Chalk that one up under unbelievably silly slot machine myths. Machines pay more if a player card is not used. Or sometimes, machines pay more if a player card is used. Myth makers can't even make up their minds! Rest assured though, the machines do not take into account whether or not a card is used. If I use a slot card the casino will report my winnings to the IRS. Slot club cards don't play a role in whether or not your winnings are reported to the IRS. If you manage to win over $1200 in one spin you will automatically be reported. Small wins are not accumulated by the casino. 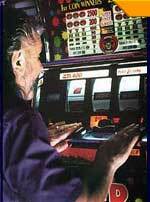 Each of these slot machine myths have been bought into at one point or another by unsuspecting folk just like us. So if you ever hear one being passed along down a row of slots in Vegas, make a point to intervene and straighten the dough heads out. Actually, you may want to leave them be, or at least intervene with a high degree of politeness.